Cho Oyu is the sixth highest Himalayan peak and one of the most beautiful mountains of the world, which means “Turquoise Goddess” in Tibetan. 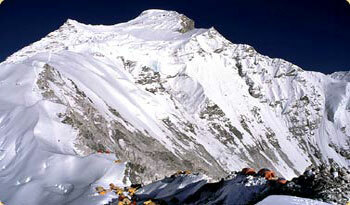 It is one of the prominent Himalayan peaks for mountaineering expeditions. It has a great history of mountaineering right from the time when many mountaineers were trying their luck of Everest. The date was on 19th October, 1954 Herbert Tichy, Sepp Jocher and Pasang Dawa Sherpa Lama (Austrian Expedition) had conquered to reach on top of Mt. Cho Oyu. There was an interesting fact about the expedition that bottled oxygen was not used. From that time onwards, more that 500 mountaineers have conquered successfully on top. Most of them have climbed from the Tibet side because the mountain is steep on the Nepal side but it looks fairly plain towards the Tibet side. The mountain was also endeavored by the well-known mountaineer Shipton in 1952. Explore Tibetan custom, way of life, exploring Buddhists monastery, large numbers of panoramic Himalayan sights as well as and wide-open Tibetan plateau. Day 01 : Arrival in Kathmandu (1350m.) airport, meet our staff, then transfer to Hotel..
Day 03 : Preparation for expedition and official trip briefing. Day 04 : Drive to Kodari and transfer to Zhangmu 2300m. Overnight at Hotel. Day 05 : Drive to Nyalam 2750m. – Hotel. Day 06 : Nyalam rest for acclimatization. Day 07 : Drive to Tingri 4340m. – Hotel. Day 08 : Day for acclimatization. – Hotel. Day 42 : Zhangmu – Kodari then drive back to Kathmandu then transfer to Hotel. Day 43 : Free day in Kathmandu. Day 44 : Kathmandu free or free for personal activities. Day 45 : Last minute, transfer to airport for onward journey.